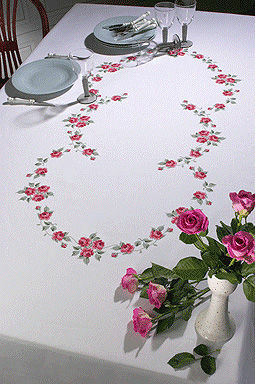 A lovely, large table cover with sprays of deep pink roses in swags. 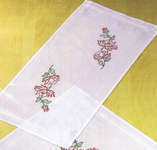 The kit has large scale black and white printed 10 stitches to 2 centimetres on eight A3 sheets, showing just over half the design. 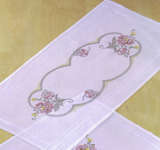 The pattern is worked in whole cross stitch and backstitch using 9 shades of stranded cottons. 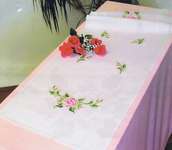 The total stitch count is by 330 by 680 with each spray of three roses worked over 70 by 50 stitches, singles roses stitched over 30 by 30 and leaves over 20 by 25. The fabric is not hemmed and must be finished after stitching.